Blame noisms for the idea which didn't go away. 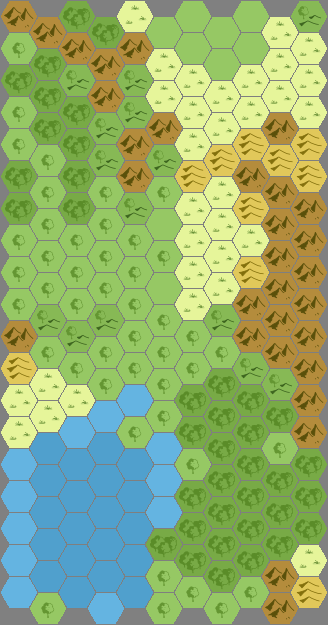 First, one hex map. This one will do (with thanks to Hexamon.net's wilderness hexmap generator). Then replicate it into three dimensions, each distinct from the other. Populate accordingly, devise ways of travelling between and what has crossed over. I want to start out traditional with hints of grim and weird. I also want to separate the worlds to make takeover bids difficult. The presence of other settings are unusual events. A traveller from one world cannot integrate easily. Locals will believe them insane, possessed or worse initially. Otherworld travel is not easy or everyone does it. Methods of transit are varied, having one of the following traits. Smart play will increase that to two, nothing makes all three happen! Eerie ships - Some ships visit stranger ports than expected. Odd passengers and trading exotica keeps them sailing until Fate decrees otherwise! Neither still or safe, they are mostly (80%) reliable. Gates - A fixed (but often unknown) location. Reliability isn't a given, some gates malfunction, have defenses or limited access. Gates are usually warded or emit deadly energies. Multidimensional tunnels - Some intersect with other worlds, monsters walk or crawl among them, some even wear human faces. Shantak - For the desperate or insane, a shantak ride can visit other worlds or leave you choking silently in the void. Shantak require negotiation and don't speak Common. Zikkuracts - Extradimensional ziggurats that permit dimensional transit via tesseracts. These require blood sacrifice to activate. A fixed location that requires bloodshed to provide risky transit. Tropes: Grimweird fantasy medieval Europe with faeries, giants and undead. Battles between human and demi-human armies. Kingdoms rise and fall while heroes fight monsters. Sense Memories: Green forests, hills and dales with distant castles. Vaulted tombs as the sun throws your shadow forth. Wind rushing through trees on horseback. Chainmail on your shoulders with castle walls solid underfoot. The roar of a thousand warriors in battle. Dark ale, roasted meat and warm lips by the hearth. Inspirations: Black Death, Dolmenwood, Excalibur, Game of Thrones, Princess Mononoke. Tropes: A decadent, decaying world with strange magic, stranger beasts and sinister automata. This world is unstable, bolstered by extraplanar transfusions. Ancient planar feuds simmer under the surface. Sense Memories: Crumbling gabled tenements and canals under aurora borealis. Grand temples redolent of incense, clockwork and rot. The roar of a distant coliseum. Embossed velvet, bizarre feathers and strange leather. Chicken and rosewater biriyani with citrus liqueur amid perfumed slaves on musky cushions. Inspirations: The Dying Earth, Wermspittle, Zothique. Sense Memories: Cave walls in torchlight, drips of cold water. Oppression of dim-lit, echoing tunnels. Spiders scuttling and weaving in shadowy, firelit rooms. Dark, musty unopened cellars. Tension of leaning over intricate mechanisms. Mushrooms and smoked sausage, flat water, huddling for warmth. Inspirations: Undungeon, all this megadungeon talk, False Machine's light economy, WW1 sapper battles. As there's three distinct settings here, all linked by interdimensional gubbins hopefully the next month won't be boring. If I don't do it here, it won't get done so... Brace yourselves, #3DPBMCSHMtm is coming!